Our latest article we discuss some recent work from Thijis Ettema’s group on discovery of a new member of the Asgard group of Archaea. The Asgard “superphylum” is a group of archaea that provide us with important information about the origin of eukaryotes. 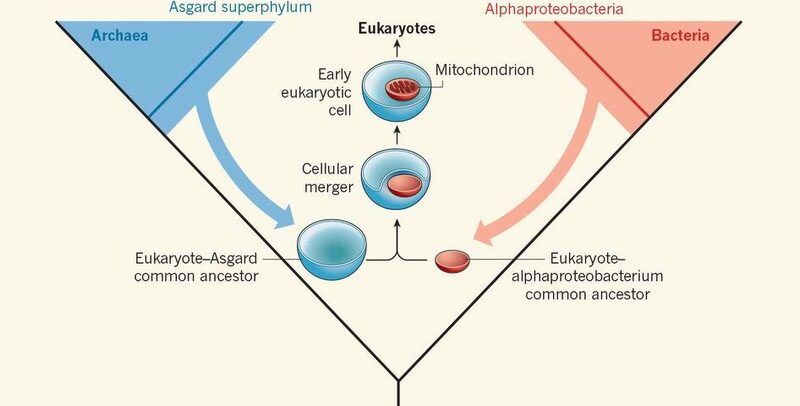 The image from our news and views article shown here summarises the relationship between Bacteria and Archaea and Eukaryotes – showing the two domains of life and the result of their merger i.e. the Eukaryotes..
Click here for the research article by Katarzyna Zaremba-Niedzwiedzka et al in Nature (11th Jan 2017).